The college has an aggressive tradition of bringing the world to Talladega. This comes in many forms, including workshops, forums and lectures, and a variety of outstanding artists, scientists, active military and veterans, as well as, political, business, and civic leaders. This engages students and provides a highly intellectual environment while redeeming post 9/11 GI education benefits. Talladega’s neighboring cities also offer many other cultural and entertainment outlets, as well as shopping, restaurants, and theaters. 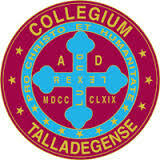 The college is just 25 miles south of the city of Anniston, Alabama, 50 miles east of Birmingham, Alabama, 85 miles north of Montgomery, Alabama, and 100 miles west of Atlanta, Georgia.